Obama, my mate is already dead! Could you react any faster if it was your family? Make a decision, we need help now! View my friends at National Geographic. Everyone is running around like chickens with their heads cut off trying to figure out who is to blame for the oil spill. It appears to be a simple question to answer. BP is responsible for the explosion and the oil flowing into the ocean. The had faulty equipment which had failed previous inspections and they had no clue as to how to stop such a major spill. 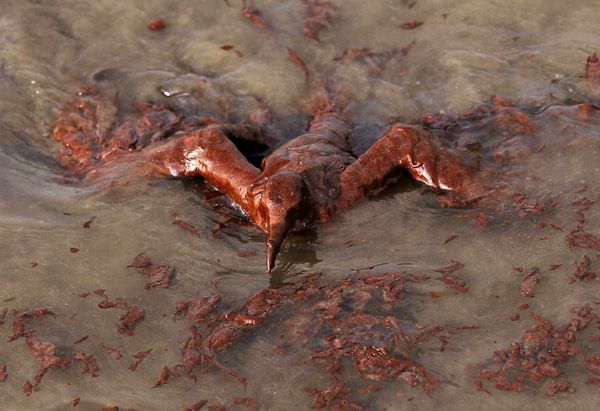 Therefor Obama is not responsible for the spill, so where does he come into this picture? From day one Britain and other countries have offered to send in material and assistance which could have helped contain the spill. Because Obama answers to the large unions he declined their offer. The union says that sending in foreign help is taking jobs from their people. Many American companies have offered solutions to clean up the oil and have the material on hand. BP nor Obama has called on them. Obama waits weeks before going to what could be the Gulf Coasts largest disaster. He makes statements on TV saying he didn't talk to Tony Hayward CEO of BP because he doesn't want talk, he wants action. He also announced 40,000 barrels of oil a day was spewing from the pipe. BP says they hope to capture 50,000 barrels a day by the end of June and 60,000 by the end of July. Where did a college educated man leading a country learn his math from? To me it appears he has no concept of the problems we face or the knowledge to do anything more than talk. His ability to lead lacks direction. For a lack of knowledge to a solution, he decides to anger people in order to take the blame from himself. He said the oil spill is as bad as the 9-11 terrorist attack. Wake up Obama, this is not an attack of terror against America, it is a man made disaster lacking knowledge on BP's and your administration's part. Stop playing your damn blame game. Maybe you should watch Governor Mike Huckabee so you could learn how to address the problem. Last weekend he had a number of guests on his show demonstrating how to fight the problem. One man treated the oil in the water, then Huckabee drank it. Another dipped a bird feather into the oily water, it came out black. After treating the oil he dipped the feather into the solution, it came out clear. When treated with this chemical it is natural and will not harm the environment or wildlife. To all the States and residents on the Gulf Coast I say tell the Federal government to kiss your butts and begin procedures to protect your beaches. Your livelihood is at stake you can not wait for a bunch of bureaucrats sitting on their brains to make a decision. Obama is using this to build his green bill, I believe he will pay the price for it in the end. Americans are ready to step up to the plate and fight the problems. Get out of the way Obama, we have work to do. Go play a game of basketball or golf this seems to be your expertise. Americans are worn out with your arrogance and agenda. Face the fact, you are not the Messiah!